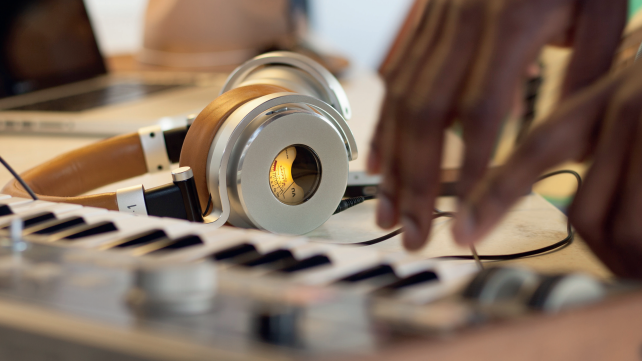 We thought we’d seen it all with luxe headphones, but we’re rather taken with the unique look of the new OV-1 cans from Meters Music. So taken, in fact, that we’ve teamed up with the company to give away three pairs of these stunners – worth £279 each. That’s one OV-1 each to three lucky winners.The first thing you’ll notice about these cans is the Ashdown (bass amp supremos who work with U2, Foo Fighters and more) VU Meters displayed on each cup. These meters track the music you’re listening to and display the volume output. Other than making you look badass, the VU Meters help you check volume levels; handy if you’re worried about potential hearing damage during prolonged headphone use. The VU Meters react in real-time to the sound level of the music you’re playing, just like a studio mixing desk does. Rad, right? And if you want to block out the noise from your surroundings, Active Noise Cancelling tech helps you do so, while also enhancing your music with a rich and balanced sound. The competition closes 3 March 2017. By taking part, you agree to be bound by the competition rules: www.futureplc.com/competition-rules. Entries must be received by midnight on 3 March 2017 (UK time). Open to UK residents aged 18 years and over. There will be three winners, each entitled to one pair of Meters OV-1 headphones. The prize is non-transferable and non-refundable. There is no cash alternative.